Quickly becoming some of my most treasured belongings are those that allow my 3.5-year old daughter to do things for herself. The kitchen is a place where I continuously ask myself, “How can I equip Emmy to be self-sufficient in this space?” There are so many appliances and utensils that I cannot allow her to use without my help or supervision at this age, but I am on the hunt for anything that will increase her independence! Mamas around the globe understand that more independence for their kids equals less work for mama! My recent priority was to find a way for my daughter to help prepare her own lunches and help me prepare our family dinners. Unfortunately, using knives and chopping food is a huge part of the meal prep, and she is not coordinated enough to use our big metal knives yet without possibly chopping off her finger. 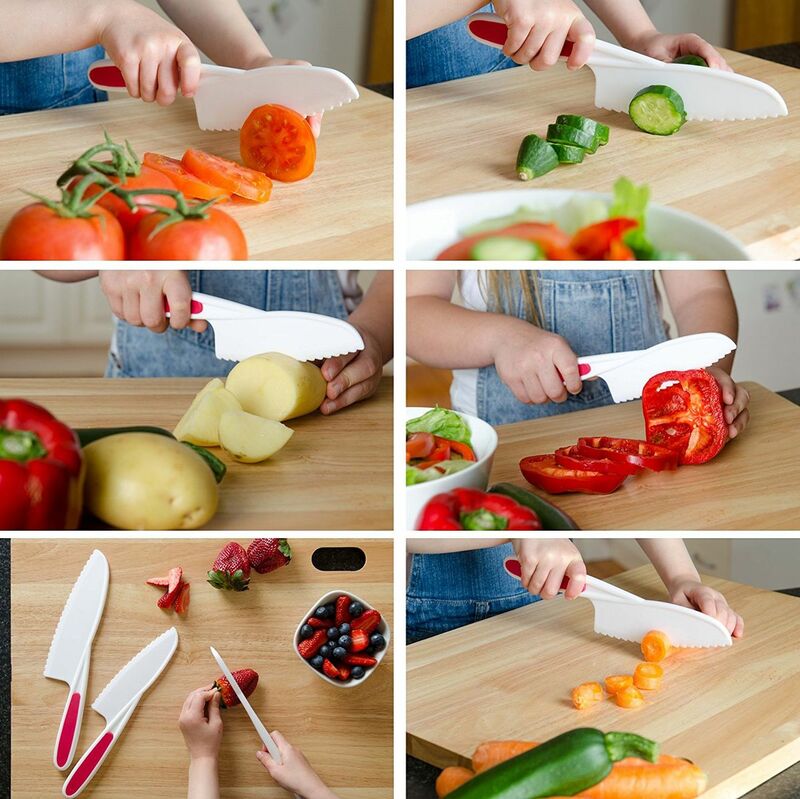 However, I knew kid-friendly knives existed after seeing Emmy cut vegetables with what looked like a thick plastic knife at a birthday party at Patricia’s Table in Austin, so I went to Amazon to begin my search! I found a few options, but the one I settled on was the StarPack Nylon Kitchen Knife Set. This is a set of 3 BPA free, plastic serrated knives with a rubber handle grip. The 3 knives range in size, the small knife is 8.8 inches, middle is 9.8 inches, and large is 10.8 inches in length. Right now, Emmy uses the smallest knife the most as it is the most comfortable for her smaller hand to hold. 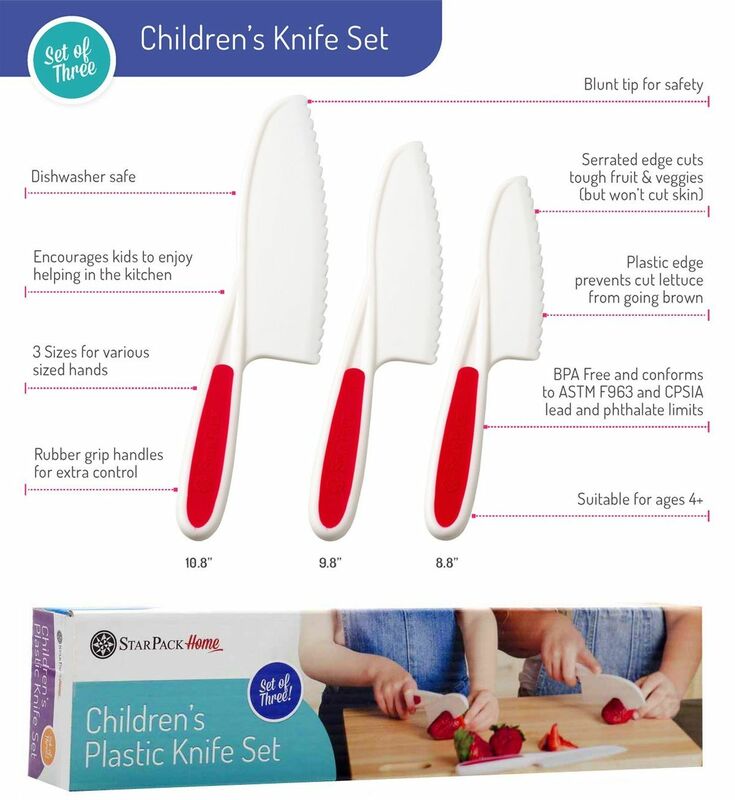 The description does say these knives are for 4+ years old, so I’m sure Emmy will expand her preferences in a year when her hands have grown a little bit. The size of these knives is probably the only aspect that I found a little discouraging for my 3.5 year old toddler. Other than that, I’d say Mission Accomplished! Mama is proud of her toddler’s growing independence! 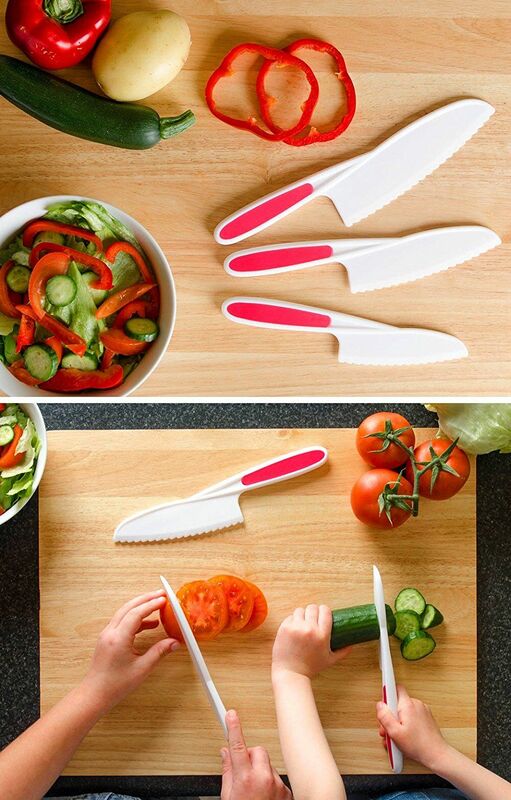 I have already sent several of my friends and family the link for these knives because I feel as though it will help change the dynamic of family time in the kitchen...as long as you encourage your children to use them often. Here’s to getting your kids in the kitchen, creating happy and healthy meals for themselves and the whole family!